Well, that, my friends, is a series! 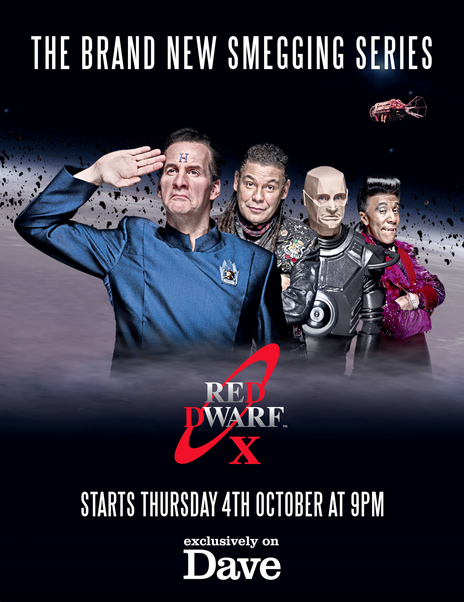 Red Dwarf X, the first “real” Red Dwarf series since 1999, is finally finished. So, after all this speculation, after all the waiting, how did this series turn out? Red Dwarf Review: Series X, Episode 6: "The Beginning"
Synopsis: In the year 2200-ish, at IO Tech, Rimmer’s teacher, Mr. Rimmer, uses Rimmer as a guinea pig to make him unsure of his decisions through life… as punishment for being late to class. Three million years later, a rogue droid named Hogey wants apparently another duel across time and space with the Dwarfers. They aren’t even fazed. Making matters stranger this time around is that Hogey stole a map of the various black holes through the universe from a Simulant Death Ship. Said simulants weren’t too pleased, and begin attacking Red Dwarf. The crew escape in Blue Midget, where they fear death. Rimmer, in particular, fears death so much he brings a holo-lamp that his father gave him to play the day he became an officer. With his father on his mind, he is unable to concentrate on a plan of action. Thus, he decides to take the ultimate dive, and play the holo-lamp early, proving that he doesn’t care about his father’s opinion anymore. There, Rimmer’s father reveals something stunning about Rimmer’s lineage. Review (SPOILERS): There are three absolutes in life: death, taxes, and Red Dwarf episodes being constructed as “last episodes ever”. Ever since Series V’s epic “Back to Reality”, every series of Red Dwarf (bar VII) ended with an episode ambiguous to the future of the series. Ironically, the even numbered series since V have ended with Rimmer called upon to save the ship. “Out of Time” was an epic ending for Rimmer. “Only the Good”, eh, not so much. Red Dwarf Review: Series X, Episode 5: "Dear Dave"
Synopsis: Lister’s having one of those days where he mopes around about being the last human alive. To interrupt his sadness, he realizes that two vending machines are fighting for his affections. Making matters worse? He gets a letter from the past, telling him that he may have sired a kid. Meanwhile, Rimmer is threatened with demotion by the ship’s onboard computer (not Holly, sadly) for failure to perform duties, putting him on par with Lister. He realizes that he’ll be able to avoid being put on equal footing if he can convince the computer that Lister’s nuts, thus giving him an excuse as to why he didn’t perform. Review: Let’s get this off the bat – this is the weakest episode of Red Dwarf X. The reason? It seems like they wanted to siphon elements from Series I and II, yet forgot what made those series… quirky in the first place. Here’s the deal- Lister has been the victim of both cheating accusations from vending machines, while realizing that his ex-girlfriend cheated on him, yet he still might have sired the kid inside of her. Remove the vending machines for a second. That is as stock a sitcom plot as you can possibly get. Engaging? Not in the slightest. What’s worse is that the “remembering the ex-girlfriend” plot was used in Series II’s “Thanks for the Memory”. “TFTM” is one of my all-time favorite Red Dwarf episodes, because it gave some insight into the characters of Lister and Rimmer, the tragedies the two-faced. That, and we actually saw Lister’s former girlfriend, giving us an emotional connection. It’s brilliant. Seeing elements of that episode used in a stock sitcom plot? Tragic. That’s just the largest of the ways this episode apes from the earlier series. Let’s have a list! Rimmer tries to maintain his position of power over Lister? Inverse of “Balance of Power”. Lister moping over the fact that he’s the last human alive? “Timeslides”. Rimmer has no idea about women? “Parallel Universe”. Lister is mistaken for robosexual by Rimmer? “Polymorph”. Lister needs to know about his children? “Ouroboros”. Yes, that failure of an episode. Lister realizes that he might have a child? Again, “Parallel Universe”. Ambiguous ending? “Out of Time”. What made those episodes work was the soul, the creativity in those plots. Even “Ouroboros”, as bad as it was, was at least an attempt to shake up the status quo. It failed miserably, but still. There, they tried. This episode? Doug could’ve removed the vending machine, and shipped it as a spec script for Two and a Half Men. Nobody would’ve noticed the smegging difference. Is there anything good I can say about this episode? Well, the gags worked, for the most part. They petered out by the time Lister takes one of the vending machines around the corner. Still, even the charades scene was decent. While it did give off some Series VII vibes, it at least was funny. Curse thee, giant worms! What a shame. After a solid, if not overly spectacular, first four episodes, we get this mediocre mess. I’ll pass it, if only because this episode didn’t really infuriate me as much as “Krytie TV” and “Pete” did. That, and it actually made me laugh more than thrice. Oh, and it was made in a week, pretty much, so I’ll give it the benefit of the doubt. Speaking of Series VII, this episode was a replacement for a two-parter that would’ve seen Kochanski re-enter the picture. Ah, at least “The Beginning” looks promising. The toilet paper joke? Damn, that ran on just a bit too long. Oh, and one more positive? The acting is pretty damn good. I still question the French accent used for one of the vending machines. Why? Favorite Scene: The charades scene. Like a Series VII gag, but better. Least Favorite Scene: The mail scene. Too similar to “Better Than Life”. Red Dwarf Review: Series X, Episode 4: "Entangled"
With little hope, Lister has to go down and renegotiate a poker game. However, the Cat mentions that Lister has a tendency to choke. Thus, the BEGG’s choke to death. Literally. They eat power cords and choke on them. Kryten and Cat, thankfully, are able to use their newfound power to find the maker of the ship, a chimp who was once a forgetful scientist named Professor Edgington (Sydney Stevenson). Review: It’s often said that “Pete” and “Back in the Red” are the worst ever Red Dwarf episodes. 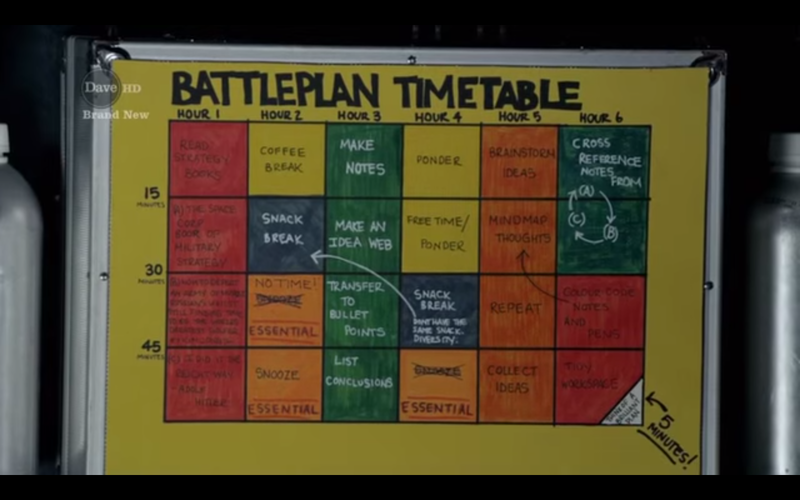 One of the (many) complaints against the episodes is that they had too much material for the originally planned timeslot (one for “Pete” and two for “Back in the Red”), so they were extended to an extra episode. Now, though, this gave them two much time, so they had to add tons of filler. Thus, we got the claymation crew, a wretched Kryten story, and tons and tons and tons of Rimmer and Lister walking into the damn captain’s office. Red Dwarf Review: Series X, Episode 3: "Lemons"
Synopsis: The crew of Red Dwarf manage to acquire a Swedish rejuvenation shower. Being the Red Dwarf crew, they assemble it… haphazardly, to say the least. End result? They wind up in Britain in the year 23AD. The remote that can transport them back? Lister tossed the battery, thinking it was used up. Rimmer suggests making a potato battery to power the remote. Kryten: Britain in 23AD, sir, doesn’t have any potatoes and won’t get them until the 16th century. Kryten: Britain in 23AD, sir, doesn’t have any lemons, either. They won’t get those until the 14th century. The nearest lemon source is India… 4000 miles away. At a local lemon market, they manage to procure lemons. Whilst talking about how primitive 23AD is, they manage to attract the attention of a certain fellow. He calls himself Jesus. Review: No matter what your thoughts on Christianity (or organized religion) might be, it’s pretty much a fact that The Bible is the most quoted and referenced book/anthology in the history of modern media. It’s influence extended beyond typical media, and has created numerous tropes- forbidden fruit, the Judas archetype, the house divided, etc. Name a trope, it probably originated in The Bible. 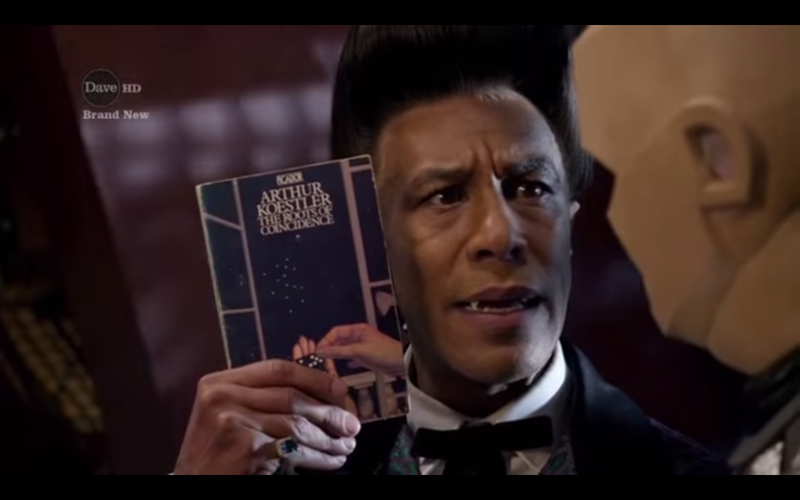 Red Dwarf has routinely referenced the book, both via jokes and as plots. Rimmer’s middle name? Judas. The religion of Mr. Rimmer? Based on a misprint in 1 Cor 13. “The Last Day”? Total send up to the idea of puritanism and the afterlife. Red Dwarf, when dealing with religion, leans heavily to the “atheist” side of the spectrum- bashing organized religion as a means of controlling the masses, as seen in “The Last Day”. (Robert Llewellyn is a self-described atheist.) The show also seemed to encourage people, however, to not use their “one life” and completely waste it- “The Inquisitor” was proof of this, with the titular character erasing those whose lives were spent totally slobbing around, unlike Lister. Most of the brutal critiques of religion were done in the vein of “silicon heaven”- the afterlife for robots. So, how could Red Dwarf take on the figurehead of arguably the largest religious belief in the West? Red Dwarf Review: Series X, Episode 2: "Fathers and Suns"
AHHH!!! DATA DOCTOR FLASHBACKS! GET EM OFF! GET EM OFF! Synopsis: Every year, Lister sends a Fathers Day card to himself, then proceeds to get wasted so that, when he sees the card on Fathers Day, he has no recollection on what he put in it. With Rimmer telling Lister that he’s a pathetic father, and with the help of the Medi-Bot, Lister decides to give himself tough love. Meanwhile, Rimmer and Kryten install a new computer, Pree. Compared to Holly, Pree has extreme intelligence, yet with a twist: her mission is entirely tied to the crew, such as repair standards and final destinations. This proves problematic when, in Lister’s act of tough love to himself, he resigns his position on the ship. Oh, and Kryten is also wondering… is a table game that he played with various vending machines the night before offensive? Red Dwarf Review: Series X, Episode 1: "Trojan"
Synopsis: The scouters aboard Red Dwarf pick up a derelict ship, the Trojan. Despite the derelict being unworthy of flight, this ship fascinates the crew, who are still stuck on a ship “slower than the speed of dark”. 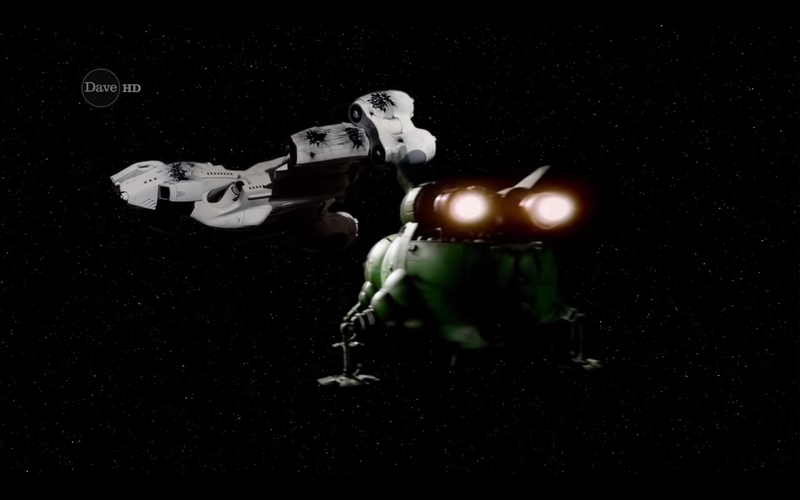 After Rimmer fiddles around with a quantum rod, the Trojan comes in close contact with the Columbus III. The hologram on that ship is Howard Rimmer. Yes. Rimmer’s brother. Already dejected from failing the Astro-Navs again, Rimmer’s resentment fills up his hard drive, causing him to suffer a crash. After being cleared of some of the “malware”, he realizes he has two options- fess up to his failures, or lie to his brother. No prizes for guessing what he chooses. Review (SPOILER-ISH): One of the central tenants of Rimmer’s character has always been the conflict between the guy and his family. It’s strongly implied that, as much as he uses them as a crutch for his aloof and insensitive behavior, that his strained relationship really did mess his psyche up. His father physically abused him, mentally abused him, his brothers tortured him beyond typical “brotherly” fights, and his mother was aloof to the whole situation, sleeping around to avoid the situation. Bringing Rimmer’s supposedly more successful brother to the center of an episode- the premiere of the first “regular” Red Dwarf episode in 13 years, mind you- was, in hindsight, a bit of a daring maneuver. Does it work?